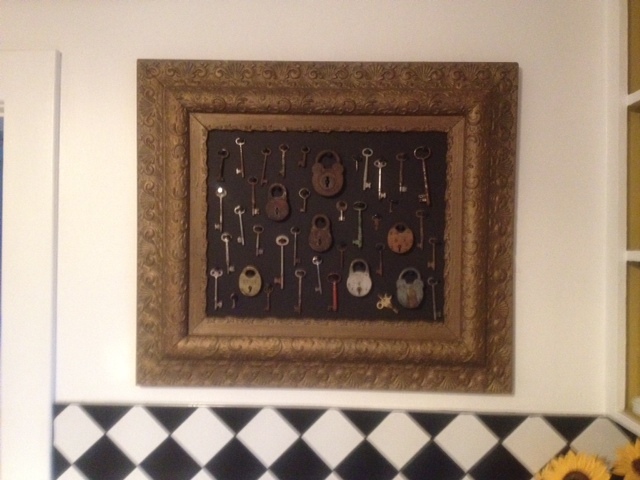 I have a small collection of antique locks and skeleton keys. I actually owned them before I was under lock and key so I don’t think there is anything subliminal but possibly they were prophetic. I pulled them from the drawer they were in and made a display. As I look at them I realize each key has the same purpose but all are slightly different. Are humans the same? Obviously we are each different but what interests me is whether we have a common purpose. At times I have been caught up in the material. I was successful; I owned my own business and properties. I was ahead of my peers though I probably felt emptier. Losing all this, I don’t in any significant way feel less than those I see driving luxury cars. Possibly I have enough esteem that I don’t need that of a jealous neighbour. I am slightly out of shape. The closest I come to a six pack is at the Brewers Retail. My hair is thin to non-existent in spots but again I don’t feel less than the nicely shaped and hairy people I come across. Possibly I don’t get my esteem from the follicles in my head or the size of my biceps. Some would say I was better looking in my youth but I’m fairly certain if this was a purpose to existence none of us would age and we would all have identical hyper metabolisms. The physical and material matters in my life don’t overly matter. I have had many relationships. I have been a father, a husband, a lover, a brother, an uncle, a student, a friend and none of these. To procreate is a strong urge in humans as are other relationships but without this ability or the stature of being at least a friend, a person does not shrivel. I did not crumble and I am ordinary in every way. Travel, entertainment or even thrill seeking are certainly desirous but looking at significant historical figures who ventured only within their counties without ever bungee jumping we can assume that despite being great, what we do for fun may have nothing to do with our greatness. Toil or occupation whether paid or not can provide meaning but unless it is in the name of something we are not much different from Oxen. A beast can pull a plow but only humans can cultivate anything important. The seeds we plant will only sprout with attention. These are some of my arguments regarding purpose; personal or weak as they may be. What then is our purpose? Does it have to be something greater than ourselves? Is it different for each of us or are we like my keys? If I am a key is it myself that I must unlock? When I unlock myself what comes out? Do we keep the same things under lock and key? Could it be that although I am less than wealthy and less than hairy I am in fact in possession of the same treasure? Do we not all hold the key to compassion, love, generosity, and empathy? Some people seem to have more of these just as some have more money or good looks. Possibly these individuals have used their key to open what many of us fear we do not have enough of to share. These contents are a little like the recycle bin; they will only be picked up if you put them out there. Your empty aluminum cans will never be made into anything new if you bury them in your backyard. Compassion can never heal or touch someone who needs it if it is left in your chest; literally. Every lock has a key. Obviously I can only speak for myself but I am coming to understand that my purpose is to unlock and share what can’t be seen, measured or appraised. To some these things have no value in any way but when shared with someone else they can be priceless. Interestingly, out of the dozens of skeleton keys I own, none of them fit the locks. I guess that is what makes life interesting. Since we are all different keys I may just happen on someone who opens a lock I own. It is often a mystery as to what a lock protects but historically it is something of value, all the other stuff is simply stuff. This entry was posted in Growth, Observations, Perspective, Spirituality and tagged civility, family, friends, Grace, journey, love, meaning, occupational therapy, perception by brettbatten. Bookmark the permalink. Thanks for the reply. Sorry for the late response. I had read your comment but left it to percolate in my mind. I haven’t come up with anything profound, like you it brings up more questions and angles than answers. I like your reference to your mother. I think we are all capable to different degrees at different times. I may have compassion and generosity now but if I was dealing with chronic pain that could easily change. My step – father sometimes refers to “cash register honesty.” We all assume we are honest and would never steal but when the cashier gives us an extra quarter many of us remain silent. To a degree we all believe we are compassionate etc. but being human we all fall short at times. Possibly the perceptions we have of ourselves keep us from being mired down in guilt. Another possibility is that if I am able to overlook my own shortcomings I may be able to overlook yours. Unfortunately, the case may be we overlook ours and point out others. It’s interesting the mental maneuvers we make to cope and thrive. I hope things are bearable in your community, I get bent out of shape when the huge tree in my yard drops a branch.